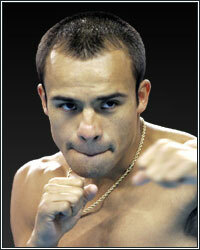 Should pound-for-pound champion Manny Pacquiao be asking Juan Manuel Marquez to take the tests? According to Victor Conte, maybe he should. Earlier today, the former founder of BALCO Laboratories and current CEO of SNAC System, Inc. informed his followers on Twitter that Marquez is currently working with an "admitted steroid dealer." Although the latest episode of HBO's 24/7 introduced him as 36-year-old Angel Hernandez, a graduate of Texas A&M's Exercise Science Program, Conte revealed that he's really Angel Guillermo Heredia, the same man who testified against a number of different athletes in the high-profile BALCO case. "JM Marquez is working w/ admitted steroid dealer Angel 'Memo' Heredia (Hernandez on 24/7). Heredia testfied he supplied PEDs to Marion Jones, lightweight champion Juan Manuel Marquez is working," Conte posted on his official Twitter page, revealing the true identity of Hernandez, who appears to have changed his name from Heredia after working as a star witness for the government. "Angel Heredia was the star witness for Novitzky and the government against many athletes. He got no time in return." According to a New York Times article, in 2005, Heredia became a witness for the government after investigators discovered evidence implicating him in drug trafficking and money laundering. Cooperating with prosecutors, he would later provide documents that included e-mails, canceled checks, phone recordings, blood and urine laboratory results and shipping records linking him to a number of high-profile athletes, including 12 who had won a combined total of 26 Olympic medals and 21 world championships. Four of those 12 athletes, including Marion Jones, who later served jail time for lying to prosecutors about her use of performance-enhancing substances, were barred from competition for illicit drug use and 8 of them had never even been previously suspected of using performance-enhancing drugs. Heredia received no jail time in return for his cooperation with the government. Now, he appears to have reinvented himself, along with with his last name, in the sport of boxing. "You cannot be doing something you did 15 years ago when really science has advanced, bio-mechanics has advanced, new studies and research has advanced," Heredia, or should we now say Hernandez, would explain on 24/7. "This fight is going to be about quickness. Obviously, Juan Manuel is quick, but not as quick as Mr. Pacquiao, but by doing what we're doing now, he's going to be definitely fast real quick and he's definitely way, way too strong." If you ask me, this third and final showdown between Pacquiao and Marquez just got a little bit more interesting.